Beijing is rolling out free internet on 12,000 city buses this week, according to state media. It’s the next step forward in a three-year “wireless city” plan that originally saw ten district hot spots open up around the city at the end of 2011. State-owned telcos China Mobile, China Telecom and China Unicom will lead the rollout, which has inevitably been met with security concerns given China’s poor network surveillance record. Despite the risks, the move will likely take the sting out a recent announcement that public transport prices will rise by up to 100% from December 28. Supermarkets, subways and other public spaces will also be targeted in the next month as the municipal government plans to provide some 90,000 access points. It’s part of a pilot scheme that will be tested over three years. Authorities haven’t as yet indicated what will happen to the networks after that time, or whether they will remain free. Since China lifted a ban on Wi-Fi enabled devices in 2009, there has been a strong push for public Wi-Fi services. Last week, passengers on the Guangzhou to Hong Kong train line trialed the first free Wi-Fi project on the country’s high-speed trains. Air China also moved to add free Wi-Fi on its flights in mid 2013, which was upgraded in 2014 and to our knowledge remains free. While unencrypted networks are notorious for security vulnerabilities, it’s unlikely to phase Beijing netizens who have become accustomed to the heightened network controls. Users will be expected to enter their phone number in return for a code to join the new networks labelled “16 Wi-Fi” on buses and “My Beijing” in other public spaces. The requirement makes it easy for authorities to identify users on the public network by linking phone numbers to activity logs. It’s a common feature of existing public Wi-Fi spaces in Beijing, including Starbucks and other coffee shops, and is unlikely to deter users. 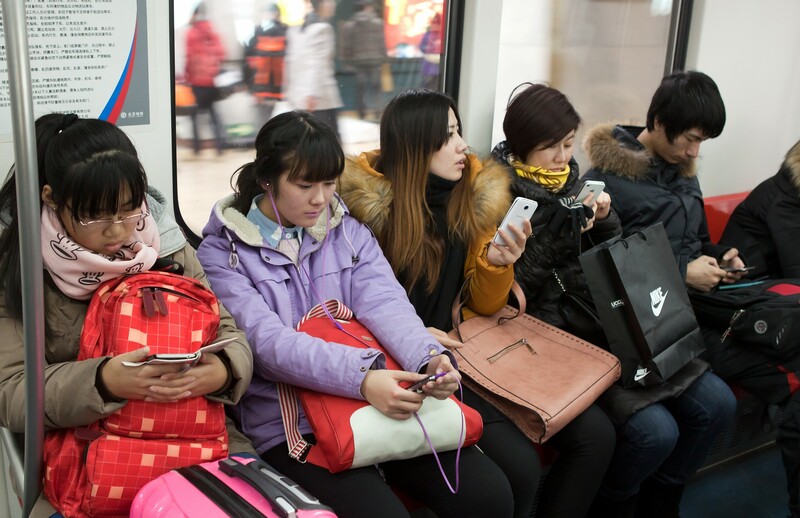 The demand for free public Wi-Fi in Beijing is obvious for anyone who has taken public transport there. It’s a common sight to see entire train carriages during rush hour lit up with live streaming content and graphic-rich gaming. It remains to be seen whether the new bus networks can support the data-heavy gaming and video content that have become ubiquitous in China over the past few years. According to state media, the connection is enough to support up to 40 passengers streaming video on a 4G connection. However the speed of the initial “My Beijing” hotspot rollout in 2011 was criticized on social media for falling well below its expected rates.